I can’t believe we have already kicked off a new school year. Did fall of 2017 sneak up for anyone else? I feel a bit like I’m in an episode of Ground Hog Day. Have you ever seen that movie? The one where the guy wakes up each morning to the exact same situation and the day evolves identically – doing the same thing over and over? Yes, that’s where I am when it comes to meal time. The irony isn’t lost on me that we’ve successfully launched our three eldest sons and now two of them are living back home (along with a third college roommate). We went from a “quiet” house with only our daughters to a full scale party house again and I feel like I am on repeat from five years ago. Our eldest is getting married in December (we are SO thrilled and I briefly shared about it here), so to avoid a double move, he’s here until then. We love it, but I wasn’t in the mind frame to cook for a crew again. Feeding girls is easy. 😉 On top of that, my book and bible study final deadlines are wrapping up, plus it’s football and volleyball season, which means travel. I am heading into a full, hectic, but life giving fall. I’ve been way too quiet here on the blog, but still post regularly on instagram with lots of little videos if you want to stay tuned. Over and over these past few weeks, I’ve been reminded anew that little things mean everything. I understand busy schedules, deadlines, and unending “chauffeur” jobs, but pair that alongside the constant nag that I’ve let the ball drop somewhere and I’ve forgotten just how much we must fight for our family meal time. I’m taking back my little moments because they matter. For our family and I bet yours too, the mundane and the magnificent intersect around the table, allowing for those holy moments to happen when we SLOW down and let them. Meals together are small acts with significant importance, but to make time to I need to get back on track is preparing homemade meals and sharing dinner time around the table. On those particularly chaotic weeks, my goal is to be very intentional about our meal time: spend less time preparing the food, more time connecting over a shared meal and slash our food budget at the same time. Doesn’t ten minutes of food prep sound like a dream come true? Give these easy ideas a try and you will be thrilled to see how quickly a wholesome meal can come together on the spur of the moment. 1. 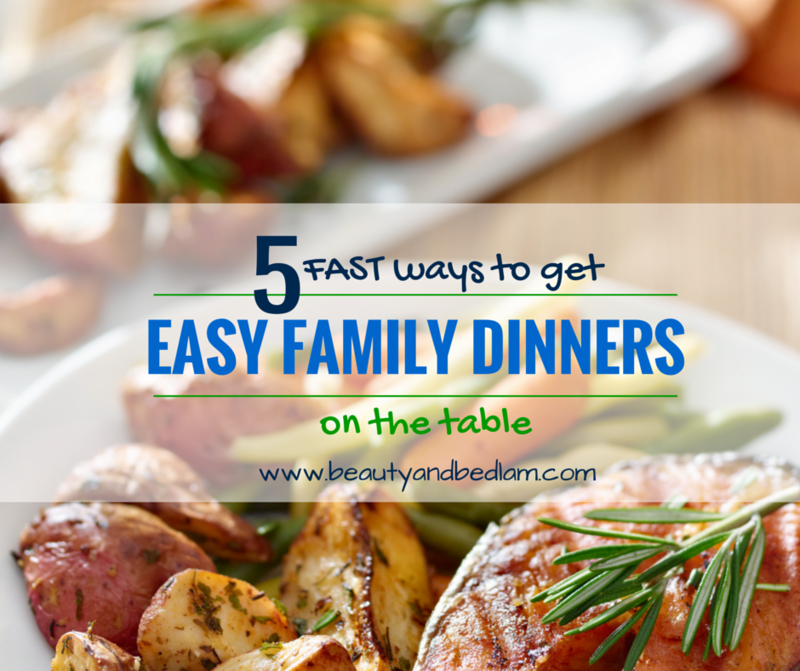 Create your “Fast Family Favorites” dinner list. When dinner time is rushed, most of us eat out, pop pizza in the oven, or get stuck in the rut of making the same meals over and over. Let’s break that habit and set ourselves up for success. One evening over dessert, gather your family to brainstorm some of your favorite, fast family meal ideas. Make a list of at least 10 – 15 tried and true recipes. If you need to do so, pull out some old cookbooks to trigger those creative juices. If you have kids, include them in this process. It gives them a voice and ownership of the family decision-making process. They’ll be much more willing to be a kitchen helper during meal prep if they know the meal they chose is on the agenda. The next steps are where your life will be saved. 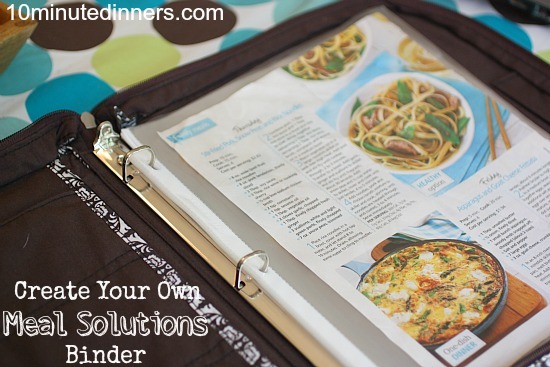 I wrote all about our Meal Solutions notebook over at 10 Minute Dinners. 2. Go for C.O.S.T. Cooking. One of my greatest feats is trying to determine how nearly every meal can become a “Cook Once, Serve Twice or Three Times” adventure. I am not talking about left overs, although I definitely recommend them and doubling recipes is always a recommendation. 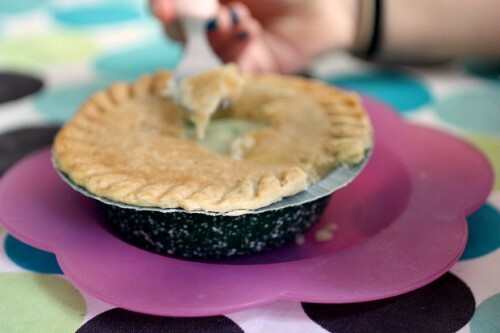 My family would be lost without leftover, but I do know that many won’t eat them. C.O.S.T Cooking sets apart the meal and completely recreates it. Every protein cooked becomes another recipe without any complaints. I’m not talking about leftovers, although I definitely recommend them, and doubling a recipe is always incredibly helpful. C.O.S.T Cooking sets the meal apart and completely recreates it. Every protein cooked becomes another recipe without any complaints. For instance, a simple Crock Pot BBQ Chicken over rice or noodles, becomes BBQ pizza the next evening. Depending on how much chicken I have prepared, Sour Cream Enchiladas, BBQ quesadillas, tortillas, or our favorite BBQ sandwiches made this a three-time winner. A second example is our family’s favorite Asian Pork Tenderloin recipe. First showcased as a main dish served with rice and vegetables, we rounded out our “Take Two” meals by serving it sliced on a warm hoagie roll topped with provolone cheese for a quick and hot sandwich. Even the biggest leftover naysayers will be none the wiser. Crockpot ground beef cooked up in bulk becomes our favorite Taco Casserole, my Mom’s homemade Sloppy Joes , Lasagna. and Dump and Run Taco Soup. 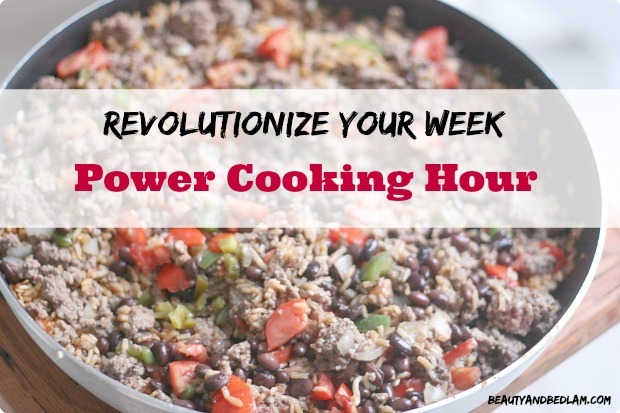 In my opinion, the best use of one hour a week is my “Power Cooking Hour.” It’s simple, become the kitchen manager that you are and challenge yourself to work against the clock. I love a good competition, so I set the timer for one hour. I then cook, chop, dice, prep and freeze as many items as I can in that time period. In one hour of concentrated time, I am able to break down certain kitchen tasks enough to prep for 8-10 meals in just that one hour. When I first started my Power Cooking Hour, I prepped 15 meals, making it possible to execute that goal of a ten minute dinner for weeks. I couldn’t believe how much I got done and after that, I was committed to setting that time aside regularly. Think through what quick items you find yourself being drawn to at the grocery store. Walk down the freezer aisle and figure out how to recreate them. Cook rice in bulk (love my rice cooker), then separate into quart size portions. Cook Crock Pot full of beans for additions to meals, taco dip and homemade re-fried beans. Bulk Baking – it’s just as easy to make up batter for four banana breads loaves, as it is just one loaf. Seasoned Ground beef packages: Fry or use the crock pot to cook up large quantities of ground beef at one time. Since we love Mexican and Italian meals, I then add garlic, onions and chopped peppers right to the beef. Once that is finished, I separate the mixture into freezer bags and add the appropriate seasonings. Chop individual bags of onions, peppers and other veggies we eat often. Some stay in fridge for snacks, while others head to the freezer. Grill or bake chicken in bulk. When we grill out, I always grill up at least ten pounds at a time. Today I checked out the price of 1/2 pound of prepackaged grilled chicken – $5.45. That’s crazy! 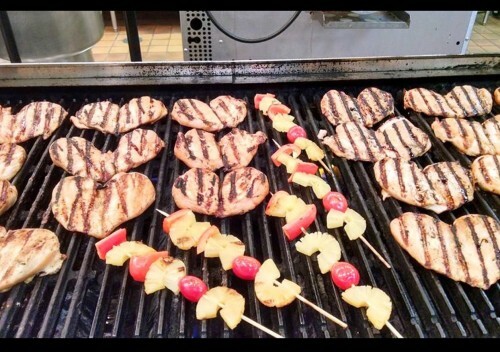 You can make two pounds of your own grilled chicken for the same price. If you bake chicken or throw it in the crock pot, always make more chicken that you will eat, so that you have extras. Once cooled, then slice, shred and chop into individual meal size freezer bags for quick additions to salads, soups, sandwiches and casseroles all week long. Making up these meal packets is such a great time saver. This Power Cooking Hour is multitasking at its finest. You will be amazed that the more often you give it a try, the more skilled you will become at having multiple items cooking and baking at once. It’s truly worth the extra effort. Whew – that is about all you can read for one day. I’ll continue on soon with two more that have rocked my little world and made all these daily tasks turn from the mundane into something truly magnificent. Hi Jen, great article for busy families. I’m sure you know this but you can get fresh unpackaged chicken breast at the Harris Teeter meat counter for 1.99 /lb. always. We never buy packaged chicken breast because of the cost! OH yes, I have it stocked in our freezer right now. I love that deal, along with the grass fed on Tuesdays at Fresh Market for $2.99. Love that too. Great tips! I am going to share these. I second DeLana on the Harris Teeter chicken, we specifically go to Harris Teeter just to buy chicken. In our house we have a menu board. Only our favorite meals are pinned on the menu board. I write the name of the entree on the front of an index card and the recipe on the back of the card. This system has been my lifesaver. I am now focusing, like you, on less prep time in the kitchen and more time connecting at the table. Love that idea, Karen – a Menu board is great, but the index card makes that idea Such a life saver. Love that. Sounds like you’ve got a lot of adults there for you to be doing everything. I say — delegate! Your family favorites idea is the perfect vehicle for this, and if they’re feeling creative they can maybe come up with some new family favorites to add to the binder.